What Do Peace and Security Grants Support? If you can find ways to give people hope that they can achieve something or make a difference, then there’s an opportunity for something good to happen. Where Do Peace and Security Grants Go? There are amazing opportunities, no matter what issue area you’re working in, to fund cultural strategies. It just requires stepping back a little bit and opening your lens, your aperture, around your issue concern. 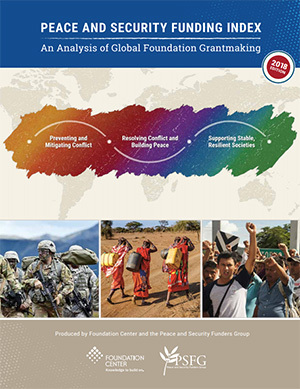 What Strategies Do Peace and Security Grants Use? No-one takes the picture of the person who builds peace. It's one of the reasons that we are here, to tell their story, allowing them to get on with their life saving work. Who is the Focus of Peace and Security Grants? The whole is greater than the sum of its parts. We can only tackle the thorniest of today and tomorrow's global challenges, like preventing atrocities, combating cybersecurity threats, and nuclear terrorism (to name just a few), if we work collectively.